You can put on the brakes if you have been cruising the web looking for an HVAC service in Parkland, Fort Lauderdale, Delray Beach, Pompano Beach, or Sunrise, Florida. 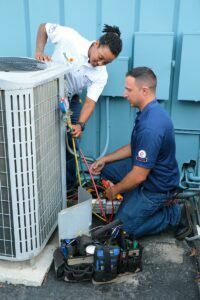 Our HVAC service, Quality Air Conditioning Company, has been standing tall as the leading AC contractor in Broward County and the southern part of Palm Beach County since the early portion of the 1970s. We are the best at what we do for a number of different reasons, and the first one is the quality of our HVAC service technicians. Our team members are the best in the business, and they receive ongoing training as HVAC service techniques evolve. The second reason why we stand head and shoulders above the competition is the fact that we have the ability to provide extremely low rates given the quality of the work that we do. Since we have been around for over four decades and counting, we have had plenty of time to develop streamlined processes. We know exactly what we are doing on every level, and our efficient operation allows us to keep our prices for HVAC service calls at a minimum. We understand the fact that you don’t have a lot of time to wait around when you are suffering in an extremely hot home during the summer months. If you need emergency HVAC service in Parkland, Boynton Beach, Coral Springs, Boca Raton, Fort Lauderdale, or any other city that is in our service area, we will be on the scene quickly. Plus, our trucks are very well equipped with all the necessary parts, so we can usually complete HVAC repairs on the first visit. In many instances, when we respond to an HVAC service call, we find a problem that is expensive to fix, but it could have been prevented if the proper maintenance had been performed. With this in mind, you may want to enroll in one of our HVAC service programs. We can provide preventative maintenance that will keep your system running smoothly at all times. Whenever you need an HVAC service in Pompano Beach, Sunrise, Delray Beach, or any other nearby community, we can be reached by phone at 954-971-1000, 954-830-7828, or 800-649-5415. We also have a contact page on this website that you can utilize to send us a message through the Internet.